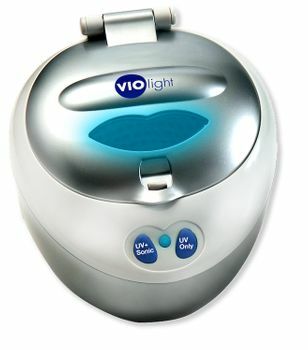 The Violife UV Dental Spa has been discontinued by the manufacturer (which is a shame because it was a great product!!) We are now only selling the AC Adapter for the Violife UV Dental Spa. If you need an AC Adapter for your Violife UV Dental Spa, please place your order above. Please note that this item is "final sale" and is not returnable. This is a neat little machine! We're so sad that the manufacturer discontinued it! can you use the dentasoak in this Violife spa? Great question, Jamie! The manufacturer of DentaSoak recommends that you use their product in the soaking cup which comes with the product. However, if you have already measured the DentaSoak properly according to manufacturer's directions, we see no reason why you couldn't use it in the VioLife Dental Spa. I could not believe my eyes when I saw how clear my invisaline retainer was after 5 cleanings in this unit. the rank taste that it had for years has also been illuminated. I am so glad I have this. I love this item. I bought the optional adapter and now don't have to worry about changing batteries all the time, although I can use them for travel. Also, this device self times and turns itself off, which is a big timesaver. Last, I love that my mouth guard is clean and germ free when I remove it. leads to five minutes of noise. Since it wakes my husband every time, I use the right hand button for UV only.